Not a bad place, but beware advance bookings ... The guesthouse itself was relatively nice. The room was quite comfortable and clean, the breakfast was good and there was no curfew which I like. The show was very weak though. 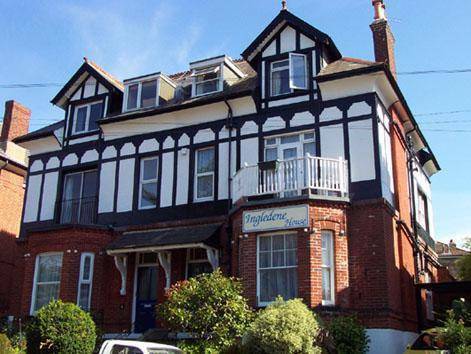 Ingledene Guest House is conveniently situated 2 minutes walk from Goldern Sands and Boscombe Beaches. The hotel overlooks knyveton gardens. Knyveton Gardens are situated on a compact site of just over one hectare, located a few minutes walk from Boscombe beaches and from Bournemouths main rail and bus stations. The gardens are surrounded by housing, private hotels and guest houses. They provide important recreation and sporting facilities for the area serving both residents and visitors to the town. The gardens offer a chance to play bowls, tennis and petanque and there are associated facilities including a modern pavilion with catering and toilets. A sensory garden has been created, with the emphasis on plants with strong scents for the visually impaired. There is also a small wildlife area and pond. These features have been developed in conjunction with Knyveton Gardens Action Group, the voluntary community organisation involved in the enhancement and maintenance of the gardens. The community is also involved in the management of the bowls, tennis and petanque facilities through the Knyveton Bowling Clubs Trust. The gardens are well maintained by onsite groundstaff. They create high quality winter and summer bedding displays and mixed borders and ensure, together with the Community Parks and Countryside Officer, that the gardens have a safe and relaxed atmosphere. The gardens currently hold the prestigious Green Flag Award. In the event of a no show or a cancellation an amount equivalent to 100% of the total booking value will be charged.